When I get a craving, it’s usually for a cupcake. Lately, I have been posting tons of appetizers here and I saved my latest dessert obsession for everyone over at Craftaholics Anonymous. 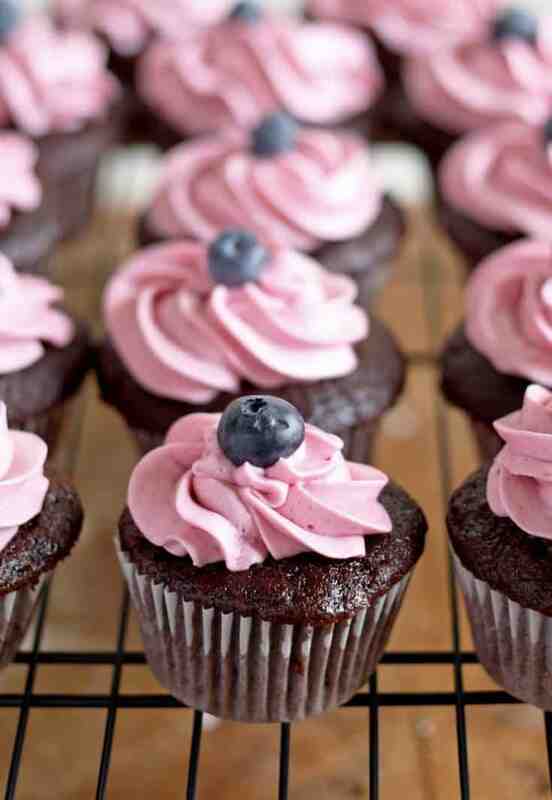 These chocolate cupcakes with blueberry buttercream frosting have become my new favorite dessert. The first recipe I shared there was also chocolate and blueberry – these cupcakes are the sweeter and more fun cousin to those scones. When I get a craving, it’s usually for a cupcake. Lately, I have been posting tons of appetizers on my blog, Honey and Birch, and I saved my latest dessert obsession for everyone here. 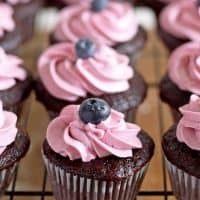 These chocolate cupcakes with blueberry buttercream frosting have become my new favorite dessert. The first recipe I shared here was also chocolate and blueberry – these cupcakes are the sweeter and more fun cousin to those scones. While the cupcakes are baking, make the blueberry “juice.” It’s really just fresh blueberries cooked in water and then smashed through a sieve so you can get all the juicy goodness out of it. For lack of a better word, we are going to call it juice. When the cupcakes have cooled, start making your frosting. There will be more blueberry juice than needed for the frosting. If you want your frosting to have a heavier blueberry taste, add extra blueberry juice in tablespoon increments. For every extra tablespoon of blueberry juice, you will need to add a tablespoon of powdered sugar so keep a little extra sugar on hand. I used a melon baller to remove some of the cupcake centers so that I could fill each cupcake. You could also just stick a frosting tip into the center and push (this is a faster, and much more fun method!) This recipe makes enough frosting to fill and frost 1 and 1/2 dozen cupcakes. 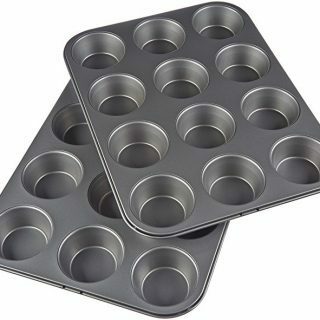 Preheat oven to 350 degrees F. Line a muffin pan with cupcake liners. In a medium bowl, combine the flour, baking powder, baking soda, cocoa powder and salt in a bowl. Whisk the ingredients together and set the bowl aside. Using a stand or hand mixer, cream together the butter and sugar on medium speed. Add the eggs, one at a time until combined. Then reduce the speed to low and add the vanilla extract and milk. Add the flour in two increments, making sure the mixture is well combined before adding the second half. Pour the batter evenly into the cupcake liners. Fill each liner to 3/4 full. Bake 15-17 minutes. Insert a toothpick into the center of the cupcake – if it comes out clean it is finished. Remove from oven and let cool 10 minutes in the pan. 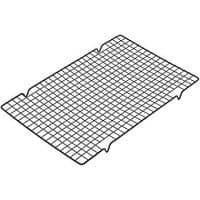 Finish cooling on a cooling rack. In a small pot, combine the fresh blueberries and water. Cook on medium-high heat for 10 minutes, stirring frequently. Smash the blueberries using a spoon, then strain the blueberry mixture through a sieve into a small bowl. Set this blueberry juice aside to cool. In your stand mixer bowl, cream the butter on high until it is fluffy. Reduce speed to medium-low and add your powdered sugar in 1/2 cup increments. Waiting until the mixture is well combined before adding the next cup. Add the 4 tablespoons blueberry juice and whip until combined. 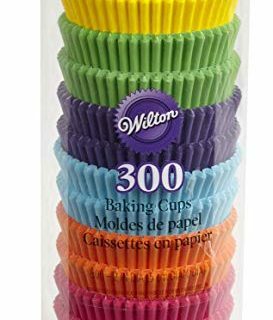 Transfer your frosting to a pastry bag and pipe frosting into the center of the cupcakes, then frost the tops. You can increase the blueberry flavor by adding an additional teaspoon each of blueberry juice and powdered sugar.